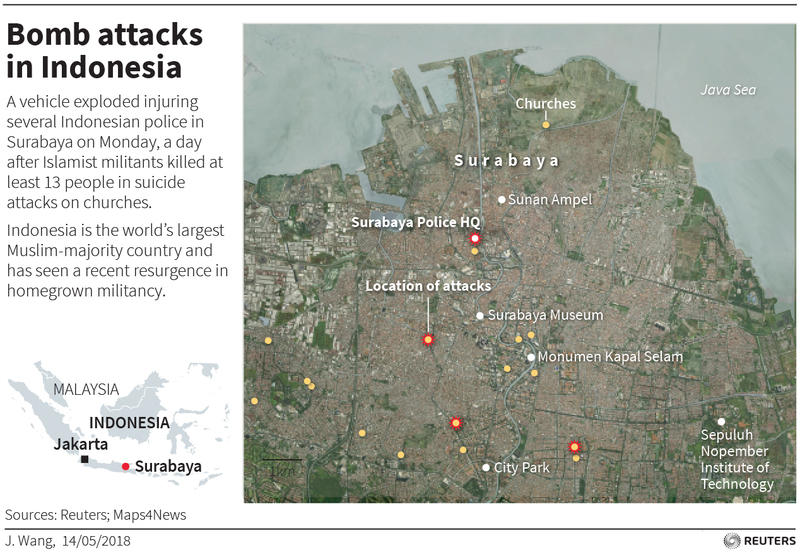 SURABAYA, Indonesia (Reuters) - A family of six launched suicide attacks on Christians attending Sunday services at three churches in Indonesia’s second-largest city of Surabaya, killing at least 13 people and wounding 40, officials said. Wawan Purwanto, communication director at Indonesia’s intelligence agency, said the main target of militants remained the security forces, but “there are alternative (targets) if the main targets are blocked”. Jeirry Sumampow, a spokesman for Indonesia’s church association (PGI), called on the government for more help for security at churches. “I am particularly close to the dear people of Indonesia, especially to the communities of Christians of the city of Surabaya, which were hit hard by the serious attack on places of worship,” he said during his Sunday prayer in Rome. Indonesia has had some major successes tackling militancy inspired by al Qaeda’s attacks on the United States in 2001. But there has been a resurgence of Islamist attacks in recent years, including in January 2016 when four suicide bombers and gunmen attacked a shopping area in central Jakarta. Additional reporting by Fransiska Nangoy, Agustinus Beo Da Costa, Gayatri Suroyo, Francesca Landini and Sami Aboudi; Writing by Ed Davies; Editing by Simon Cameron-Moore and Lincoln Feast.